Showroom Hours: Open 7 days. Very nice staff, and extremely helpful and clean. I highly recommend them! John’s involvement in fitness and wellness goes back over twenty years and began with a personal quest to improve his health. He started by taking up jogging and cycling, and later set up a home gym, thanks to Total Fitness Equipment. His passion for wellness, nutrition and exercise first led him to a small nutrition business and later to selling exercise and fitness equipment. John is a Vision Fitness “Sprint 8” certified associate, he has completed the TRX Certified Suspension Training Course, and has been a IFPA certified Personal Trainer. He has been with us since 1998, managing our Manchester showroom and helping us to grow. As a personal trainer and cyclist, he takes fitness and nutrition seriously in his quest for optimum health. 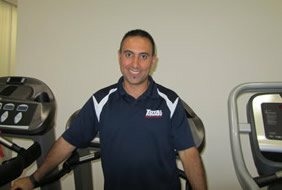 He enjoys sharing his knowledge and passion with customers, and ultimately helping them to find the right exercise and fitness equipment. You want to get fit; it is a long term goal — you know that! But there always seems to be a reason to put it off and not make the actual commitment. You always come up with an excuse. Getting physically healthy — and staying that way — requires the right mindset and the help of some excellent fitness equipment. Those excuses stop here. Why? Because we all know that life is very short and there is no better time to do anything than absolutely right now. Let us at Total Fitness Equipment help you get started; we have the gear and know-how to put you on track! Total Fitness Equipment will get you on the move. Our family-owned company is dedicated to your health — that’s what we do! And we do more than merely sell and lease physical fitness equipment; we back up everything we do. Now you are ready to take the plunge so let’s get started. And so much more; the list does not stop here! Total Fitness Equipment has specialty products like helix lateral and stretch trainers, stair-climbers and cardio bikes. Review our assortment of suspension training items and general fitness tools — we have a lot to offer. In your home gym, you can also select from a number of top-of-the-line functional trainers, cage systems, cross trainers, weight benches, free weight machines, leg extenders and body lifts; we have it all! By the way, today’s technology can assist in your fitness goals; check out our blogs and information on fitness tracker apps and other high-tech gadgets. For both commercial and residential areas, Total Fitness Equipment is your source for developing specialized fitness center flooring, locker rooms, steam and sauna equipment — even children’s playgrounds! Total Fitness Equipment partners with elite fitness equipment vendors such as TRX, Landice, Inspire, Vision and Precor. We also work directly with you to help create the best fitness plan for your needs. Our expertly-developed Total Fitness Team is made up of certified personal trainers whose own lives revolve around healthy activities and structured physical regimens. We won’t just sell you products; we will get you on the track to actually using them including installation, repair and maintenance, relocation and instructions. 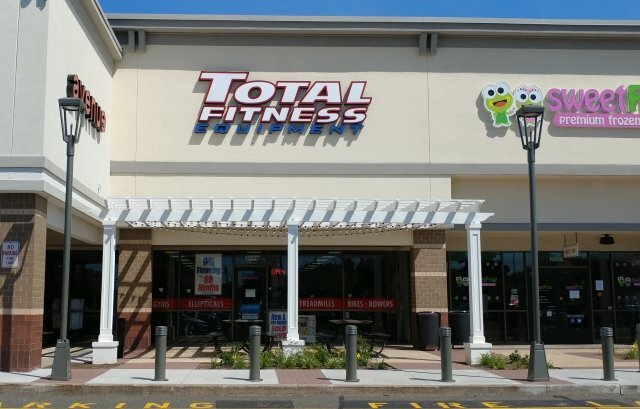 Our goal at Total Fitness Equipment is to offer you on-site preventative maintenance, a reasonable turnaround, flexible service plans and of course, expertise on all major brands. We have an ever-changing selection of Certified Pre-owned and demonstration models too, guaranteed to be in excellent condition upon purchase. Stop by one of our locations and see what’s in store for you! Total Fitness Equipment is THE go-to source for home and commercial exercise gear; with physical locations in Connecticut; Avon, Manchester, Newington and Orange. Visit our store in West Springfield in Western Massachusetts. For commercial sales (business, hotel, gym, etc), contact us at 860-290-8553; extension 20.